Professor Michael Adams is an internationally recognised specialist in corporate law, corporate governance, securities markets regulation (insider trading and market manipulation) and legal education (especially e-learning). Michael has been writing, teaching and regularly presenting on all these topics for over 30 years. He is Head of UNE Law School from 2019 and previously Dean of Law at WSU (2007-2017). He is a Fellow of the Australian College of Educators (FACE); the Australian Academy of Law (FAAL), and also Fellow of the Governance Institute of Australia (FCIS/FGIA-Life). Professor Adams is formerly President of the Australasian Law Teachers Association, the Corporate Law Teachers Association and Chartered Secretaries Australia (now Governance Institute). Formerly the Deputy Chair of the Council of Australian Law Deans (CALD); a director of the Australian Academy of Law, director of Australian Pro Bono Centre. 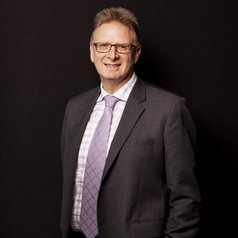 He is a director of the anti-slavery charity, FreedomHub Ltd and on the advisory board of Information Governance ANZ. He is the co-author of ten books and 20 chapters, 100 articles and over 250 conference/seminar presentations. In 2000 he was the recipient of the Australian University Teacher of the year for Law and Legal Studies and recipient of the GIA President's medal.